Last week we made the journey up to the coast near Newcastle for our niece’s wedding. We had a great time and Hollie thoroughly enjoyed dancing at the disco and playing on the sand, even though the weather wasn’t the best. For the wedding I made a couple of cards. One for us to give and one for my sister in law to give. The first one I made for my sister in law to give. I decided to go with a blue and white theme but added some silver in the end as it would have been too plain. 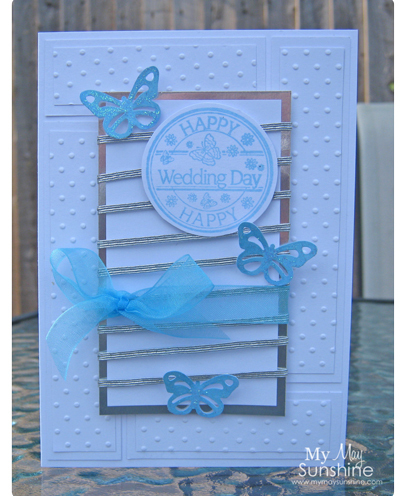 I used layers on the pieces of card to give it a bit of dimension and wrapped some elastic ribbon around the centre piece to add some colour and added some glitter to the butterflies to make them sparkle. Stamp – Lili of the valley | Ribbon – Hobbycraft | Swiss dots embossing folder | Martha Stewart butterfly punch | Ink – versacolor | Glitter – Stickles crystal. I really liked how it was quite simple in terms of the colour but has a lot of texture on the card. Hope you all had a good week and have good weekend too. Previous Post 20th and 21st birthday cards – part 2.